When placing your parent into a nursing home, you will likely come across the term ‘Nursing Home Bonds’. As you’ve probably noticed, there are a variety of fees and costs associated with nursing homes. So it’s pretty understandable if you find yourself confused about what these aged care bonds are. Here’s a quick guide on everything you need to know about these bonds. What Are Nursing Home Bonds? Let’s begin by defining what nursing home bonds are. Nursing home bonds are also referred to as Accommodation Payment or Refundable Accommodation Deposit (RAD). Paying for a bond is similar to paying bond for an apartment/home rental. The only difference is that the total amount you pay for the bond will usually be much more in this case. You will be required by the nursing home you choose, to pay for the bond when your parent is entering the home in addition to other daily costs and fees. This bond is fully refundable once your loved one leaves the nursing home or upon their passing. The amount of bond payable will normally depend on your parent’s income, assets as well as the type of nursing home chosen. Any resident with assets amounting to less than $48,500 will usually not be required to pay a bond. Make a lump sum payment (full amount payable in 6 months). Make regular payments every fortnight or month. A combination of both lump sum and regular payments. If you haven’t been using a financial adviser, it may be good to consult one at this stage. They will help you choose a payment method that won’t affect your parent’s pension or leave you with a heavy financial burden. What Is The Bond Used For? According to the Australian law, the nursing home you pay a bond to should invest all bonds received in approved investments. The home should then use all the income earned from the bond to provide quality services. Do You Need To Sell Your Home To Pay The Bond? When it comes time to pay for the bond, most people will often consider selling their home to raise the money. However, it’s important to note that selling the family home is not always a viable option for everyone and really depends on each family’s individual financial situation. It’s important to consider all available options before settling to sell the home as this is a decision that will leave you with huge financial implications. This is another major decision that your financial adviser can help you make and ensure you keep your family wealth protected. Nursing home bonds are confusing – there’s no doubt about that. Seeking an expert’s advice will help you understand them better and lessen the stress. A nursing home expert will fully explain all the fees and costs you will have to pay while ensuring that you don’t pay more than you need to. At Core Value, we can ease the burden of making difficult home care financial decisions. With our expert financial strategies you can minimise your bond fees substantially. 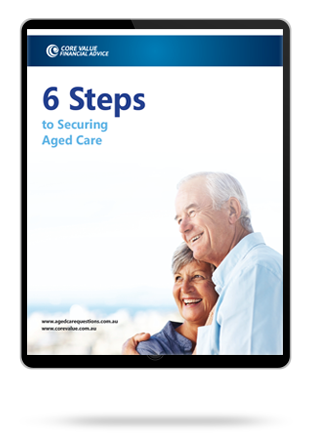 We’ll also show you how to maximise Centrelink and DVA benefits. We also negotiate nursing home fees on your behalf and make sure you’re never getting the short end of the stick. Call us on 1300 944 011 to schedule a free consultation.